Use the form below to inquire about Traditional Homestay at Chettimani . Use the form below to reserve for Traditional Homestay at Chettimani . Living room below with a bed in each of the rooms. The best part about the attic room is it has a ladder to reach the bedroom upstairs. Has approximately 500 square feet of area that comes with its own personal space, hammocks, and the facility for a private bonfire. It is completely handmade and has beautiful paddy fields and hills for views. It Is a tented cottage built on a wooden log platform located high above the coffee plantations with the valleys around. Same as the Mud Cottage and accommodates four people. The only difference is that it is located up in the estate, overlooking the complete property and the surrounding fields and hills. The property is located deep in the Kodagu region, where fresh air, scenic vistas, and peace of mind are not just luxury but a way of life. The Traditional Homestay at Chettimani near Madikeri advocates the philosophy of doing nothing and redefines luxury in every way possible. And aren’t the perfect holidays meant for just that — doing nothing? Revel in the festivity called life at this little homestay nestled in the lap of nature in the lush green valleys of Coorg that will make you want to relocate for good. Away from the hustle and honks of the city, this homestay redefines simple living through its traditional accommodation that has all the comforts you would need to feel at home. With all of five rooms in the middle of a village plantation, the homestay is all about having an unlimited relaxed space to unwind with limited interference. The Main House has two rooms. One is a large room equipped with a comfortable bed and a futon and the other one is an attic room with a living room below, with a bed in each of the rooms. The best part about the attic room is it has a ladder to reach the bedroom upstairs, which adds a touch of a thrill to an otherwise chilled out stay. The Mud Cottage has approximately 500 square feet of area that comes with its own personal space, hammocks, and the facility for a private bonfire. It is completely handmade and has beautiful paddy fields and hills for views. It can accommodate four people quite comfortably. The Upper Cottage is quite the same as the Mud Cottage and accommodates four people. The only difference is that it is located up in the estate, overlooking the complete property and the surrounding fields and hills. The Coffee Canopy is a tented cottage built on a wooden log platform located high above the coffee plantations with the valleys around. It is the perfect holiday abode for adventure lovers and offers the best views compared to any other room on the property. What’s common among all these five types of accommodation? A lot of leisurely lingering like there’s no clock to catch up to when you are at this traditional Homestay at Chettimani. From games and books to trekking and bonfires, you can pamper yourself, away from your busy schedules and professional calls. Of these, the food at the homestay deserves special mention. You get food all day, literally. You can kick off your day with bed coffee or tea, followed by a heart-warming breakfast and sumptuous lunch and wind up your day with a splendid dinner. If your tummy starts grumbling between meals, worry not. Unlimited tea, coffee, snacks, and non-packaged juices are part of every package. So order away and eat, drink, and make merry. And of course, do just nothing. Offers and special pricing are available for long stays and multi-week stays. Other than doing nothing, which is the theme of the homestay, there are quite a lot of things to indulge in during your stay . If you love reading, you would find solace in a cozy corner you create for yourself in the homestay’s well-equipped library. You could also play Scrabble and other board games, considering you would want to keep your book down! Do you love experimenting with food, both the eating and the preparation part? You can indulge in cooking a Coorgi meal with the help of cookbooks and local experts. Playing badminton and lazing around a bonfire are other things to do at the homestay. The hills and valleys of Coorg are a birdwatcher’s paradise. You can spend your day admiring the many varieties of birds that are common in the region. There’s just the right place to see many of them only a few minutes’ walk away from the homestay. Spot as many as you can to your heart’s content or until the sun goes down and it becomes hard to see any more of the fluttering beauties. You can also go on treks of varying levels of difficulty — Coorg is a trekkers’ paradise where the hills beckon the hidden adventurer in everyone who visits. If you’re ready to put doing nothing at stake and venture out to explore the other gems of Coorg, you can drive down to one or all of the must-visit places in and around the city. While the Bhagamandala Temple is 4.5 km away from the homestay, Talacauvery is 9 km further up from the temple. While you’re there, you should also check out the popular areas of interest in Madikeri, including Raja’s Seat, Abbey Falls, and the fort. 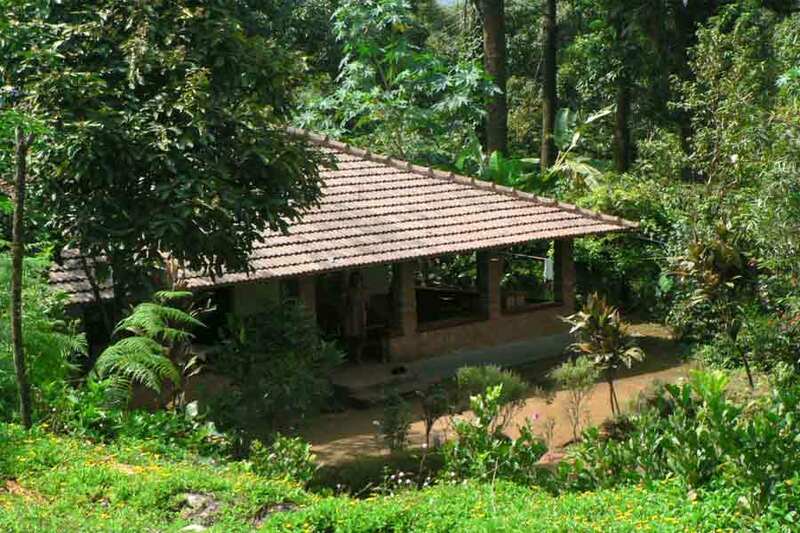 The property is in the village of Chettimani, which is located 30 km away from Madikeri, Coorg. Madikeri doesn’t have an airport and the nearest international airport from the property is Mangalore International Airport (167 km). You can also fly down to Calicut International Airport in Kerala and take a trip to Madikeri by road. The international airport at Bangalore is located at a distance of about 316 km away from this traditional homestay. All these airports have regular flight services to all major cities in India. There are no railway stations in Madikeri and the nearest railway station from the property is in Hassan (135 km). Mysore Junction (147 km), Mangalore Central Railway Station (160 km), and Bangalore City Railway Station (290 km) are some other options in you can consider in Karnataka. Alternatively, you can consider boarding a train to some of the nearby railheads in Kerala, including Kasaragod (86 km), Thalassery (126 km) and Kannur (133 km). You can alight at these stations and take a trip by road to reach the resort. The homestay is a lovely drive away from Bangalore, which is about 290 km away from Coorg. You can also drive to this property from Mysore (122 km) or Mangalore (160 km) via the Mangalore - Mysore Highway that connects these two cities. Enroute, you will be spoiled for choice when it comes to stopping for a food break, especially on the Mysore Road. Thalassery (126 km), Hassan (134 km), and Wayanad (146 km) are some of the popular destinations you travel by road from Madikeri.